At this point I've given up on putting myself on self-imposed makeup diets because I know I can't resist a good beauty deal and, you know, it's "for the blog".... The only effective method that works for curbing my makeup spending is to allocate those funds toward something else. This year, that something else is my wardrobe. I um and ah over classic staples that I know I will wear for years but stop myself short due to the price. I figure if I can cut back on beauty spending and redirect that money towards saving for a beautiful everyday handbag or a stunning pair of earrings, I can both trim my beauty stash and build my ideal closet. To guide my quality over quantity mentality, I am aiming to limit myself to 15 new wardrobe purchases. This encompasses clothing, bags, shoes and accessories such as scarves and jewelry. For the sake of my sanity, I'm not counting things like socks and bras because those are actual necessities. With the first month of 2015 already gone, I admit I haven't quite paced myself so well with already four new additions to my wardrobe. The first piece is a faux sherling vest from Zara which I had my eye on for months and was discounted from $100 to $60. The other three purchases are all shoes as I think I'm lacking in the footwear department. The first two pairs are impractical purchases that you see above. I rarely have a reason to wear skinny heels as I'm always stomping on pavement and running after trains. But I find that when I actually have an event to go to, I'm left with few shoe options to go with the rest of my attire. 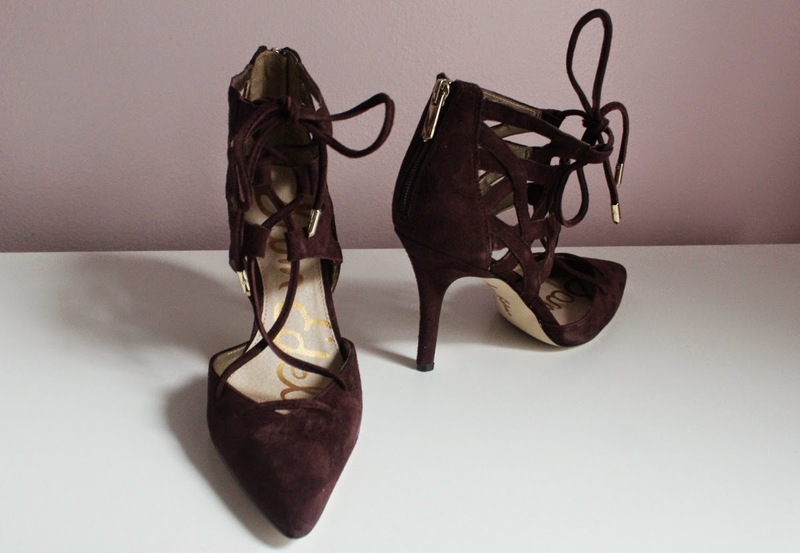 The first pair are Zara lace stilettos complete with the pre-requisite ankle straps that I need to keep these from flying off my feet. The classic details and black color mean I can wear these shoes for years without looking dated. I look forward to wearing this pair for events where I don't plan on walking a whole lot because they're not the easiest to walk in. I believe the original price was about $80 or $90 and I picked them on sale for $40. The next pair are the Sam Edelman Zavier which I found at Saks Off 5th at the Woodbury Commons Outlets. I saw these strappy sandals awhile ago online but I didn't find them practical enough to warrant the $140 original price. They were discounted to $75 at Off 5th and I reasoned these would be a good statement shoe even with a more casual outfit. I was feeling pretty spendy that day so these came home with me. The ankle detailing make these surprisingly comfortable to wear and easy to walk in. The last pair of shoes is another Saks Off 5th find that literally made my heart stop when I picked them up and inspected the price tag. For about two years I have had the Stuart Weitzman 5050 Boot on my wishlist but didn't know if it was worth the $635 price tag. I even tried them on at Bloomingdales but felt the sole was a bit too flat for comfort. I was skimming the racks at Off Fifth and at the bottom shelf I spotted a folded pair of black leather boots similar in style to the 5050. 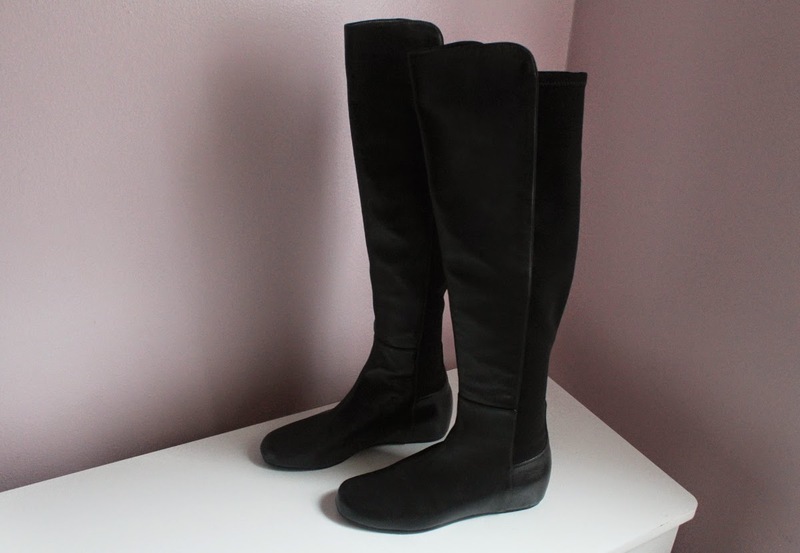 Somehow I had found the last pair of the Stuart Weitzman Lander Boots in my size (7.5) at the store! The best part was that I scored this pair for $324 (tax not included)! The Lander is very similar to the 5050 aside from the slight wedge heel which is concealed with smooth black leather. The over the knee look is very flattering and the stretchy back panel is very flattering for thinner calves. It can be a struggle getting these on and off, especially the latter, but it's an issue I'm willing to overlook. I haven't worn these out yet as I'm slightly paranoid about getting the leather scuffed or dirty from salt on the sidewalks. 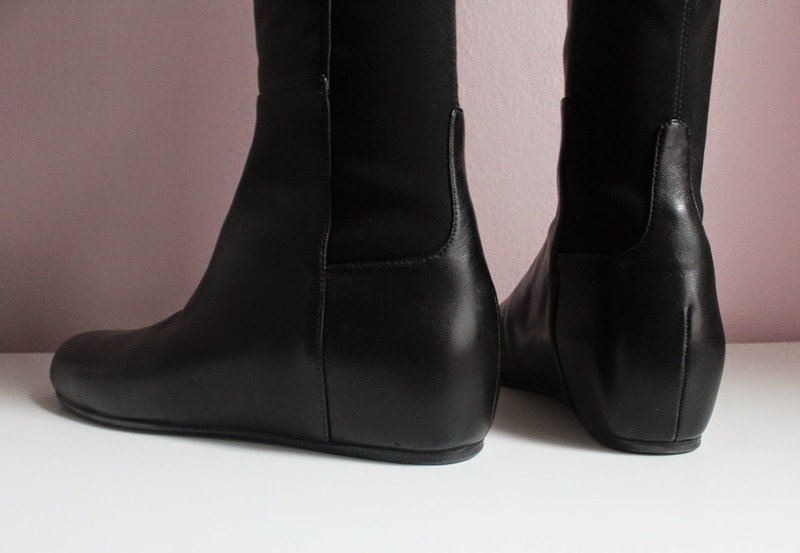 These boots will definitely get a lot of love once all this snow in New York melts. That's about it for my little shoe update and my wardrobe mission for 2015. Looking forward to doing some outfit posts when the weather is warmer and I'm not scuttling about in a North Face jacket and rather uncomely, but warm, attire. How do you budget when it comes to shopping for clothing and accessories? What investment pieces have been worth the money?